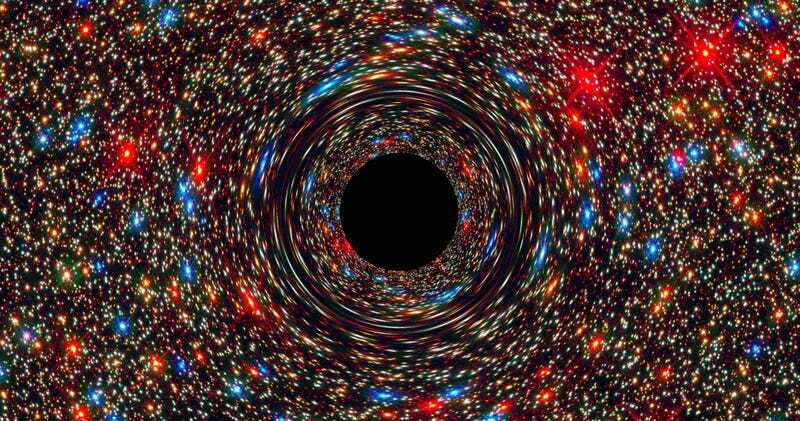 Astronomers have just discovered one of the biggest black holes ever. Even more surprising, though, is where they found it—and the strange reason it got so big. The newly discovered black hole tips the scales at more than 17 billion times the size of our sun, making it one of the largest ever found. Supermassive black holes, even of this size, are not totally unknown—the largest ever observed is slightly bigger at 21 billion times the size of our sun. Usually, black holes this big are found at the center of a giant galaxy cluster. This supermassive black hole, however, was found in a modestly-sized elliptical galaxy, with only a handful of surrounding galaxies nearby. It’s a finding so unlikely that researcher Chung-Pei Ma of the University of California-Berkeley compared it to running across a single skyscraper surrounded by cornfields.